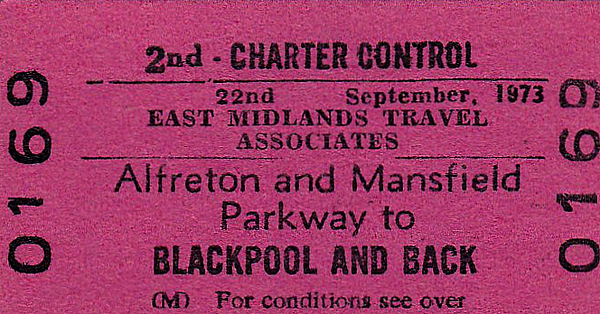 BR EDMONDSON TICKET - EAST MIDLANDS TRAVEL ASSOCIATES - ALFRETON & MANSFIELD PARKWAY - Second Class Day Excursion to Blackpool, September 22nd, 1973. Alfreton Station had closed in January 1967 but re-opened in May 1973 as Alfreton & Mansfield Parkway, Mansfield then being the biggest town in Britain without a railway station. In 1995, Mansfield got a new station on the 'Robin Hood Line' and Alfreton became Alfreton again.